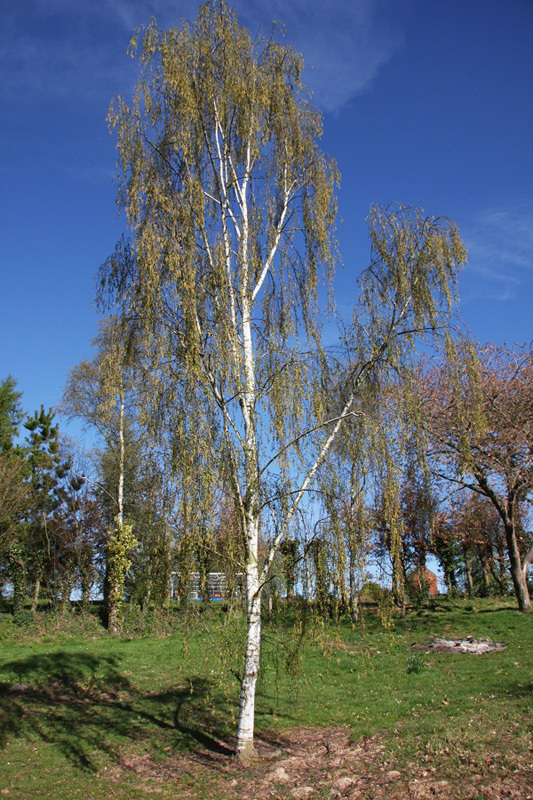 Tristis is a more weeping variety of Silver Birch (Betula pendula). This tree is distinguished by its tall narrow stature, with pendulous twisting branches. Its white bark has balck fissures with age. Leaves are triangular to diamond shaped, bright green which turn yellow in autumn. It carries attractive greenish catkins. Expect a final height of 6 m or 20 ft. The height you get depends on what type of garden you have. Imperial gardens grow trees in feet and metric gardens grow them in metres! Our Tristis Silver Birch Tree is supplied at a height of between 1.5 and 2.0 metres in a 5-12 L container, which means that the tree can be planted any time of the year and with better results than either bare-root or rootballed trees. 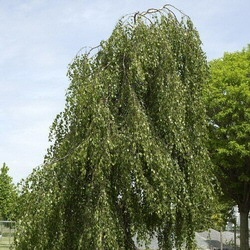 The Tristis Weeping Silver Birch tree does not weep as a young tree. We do not mean that it is a tough nut and it does not cry at the Andrex puppy, X factor slow motion replays and other emotionally charged video but that it the Tristis will start to weep under the weight of its branches as it gets older. We cannot tell you when this will be as local weather conditions and soil will dictate growth and therefore weight. A measure we do not endorse is to tie bricks to the outer branches because it then looks like you are growing them and we would get flooded with requests for weeping brick trees.